Since its inception in 2010, True Life Trio has enchanted audiences with their powerful harmonies. Their concerts take audiences on a borderless journey through the villages of Ukraine, the mountains of Bulgaria and Louisiana’s Cajun county demonstrating the beauty, power and diversity of vocally-driven folk music from Eastern Europe and North America. TLT honors these traditions while adding their own unique spin via innovative arrangements and folk-inspired compositions. The trio’s fiery and supple vocals bridge musical worlds and deliver them right to the listeners’ ears. True Life Trio’s performances include a mix of a cappella songs and tunes accompanied by fiddle, guitar, accordion and percussion. 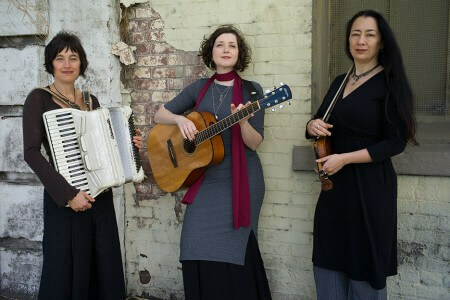 In any given concert, the trio will sing in more than ten languages, interweaving translations, tales of their travels and background stories that bring this beautiful music to life and demonstrate their passion, joy and humor in singing together. Doors open 7pm, show at 7:30pm. KALA is located at 1017 Marine Drive in Astoria. Full bar, Ages 16+ please. Advance tickets online: libertyastoria.showare.com. Pick-up will call tickets at KALA, at the door/time of show.